I just entered the new Emerald City. The proprietor here, however, isn't The Wizard of Oz, and this sure ain't Kansas. This is the MGM Grand's City Center, located on the Las Vegas Strip. You may have heard of it by now. 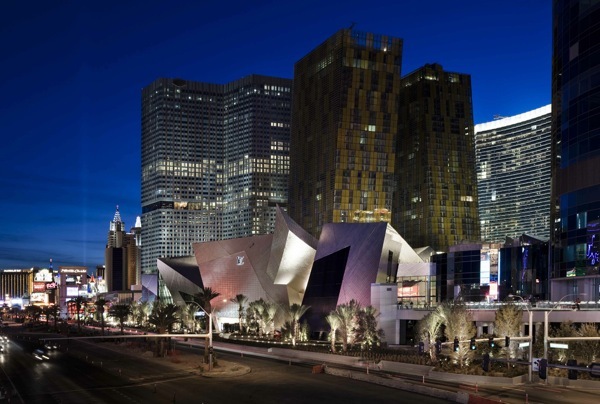 City Center's Mandarin Oriental Hotel, Aria Casino/Hotel, Vdara Hotel and Crystals retail experience just came on stream over the past two weeks. Veer Towers, a modern-day take on the Leaning Tower of Pisa, is two condo buildings nearing completion. The Harmon is yet another high rise still under construction. City Center is simply the biggest, best, greenest, edgiest, most beautiful, over the top, spectacular, mind-blowing commercial/retail/residential development I've ever seen. Yes I said greenest. City Center is the largest LEED project ever, achieving six separate gold certifications. You have to give props to developer/co-owner MGM Grand (Dubai World owns the other 50 percent) for having the vision and deep pockets necessary to design and build the most ambitious sustainable project of its kind in the world. City Center is located on the Las Vegas Strip, north of Mandalay Bay and Monte Carlo, south of Bellagio. Sixty-seven acres - about 12 square city blocks - 18 million square feet of buildings which are so individually exceptional they should compete with each other, but instead they harmoniously meld into a stunning tour de force of architecture, art, and design. It accomplishes what no one man or woman could do. Names like Helmut Jahn, Daniel Liebeskind, Caesar Pelli, Gensler Design, Adam Tihanyi, David Rockwell, BBMG Design, WET design and Steve Marino, among dozens of other top designers, architects, and visionaries, all worked together to make City Center happen. I wonder how they got all that talent and ego to drive the same bus? The use of sustainable materials throughout the project is innovative. The FSC (Forest Stewardship Council) woods found on walls, staircases, trim and sculptures in Aria and Crystals are breathtakingly beautiful. Drip water irrigation takes care of the landscaping meandering the lobbies, driveways and entrances. The feel of this project merges a park-like theme, a big city downtown, and a cultural center into one. City Center has upped the ante worldwide by delivering uber sophistication in a very sustainable package. Walking is the best way to get from building to building; a people-mover tram snakes its way around the facilities. Think of Rockefeller Center, Las Vegas style. MGM claims that water use is reduced by 60 percent for landscaping and 33 percent for bathrooms and restaurants over conventional buildings. Low flow plumbing fixtures are found everywhere. Most of the lighting in both the public spaces and hotel/condo rooms are LED lights. Almost all demolition and construction waste was re-used. Total estimated energy savings is 30 percent vs. a typical non-LEED structure. Cindy Ortega, MGM Senior Vice President of Environment and Energy, attributed their success in earning the six LEED awards to a process-oriented approach that doggedly pursued each requirement line item by line item. Efforts to make this $8.5 billion project truly sustainable extend down to details like the fragrances wafting into the air in the hotel lobbies, which are guaranteed to have no harmful VOCs or chemicals, to special blowers in the base of the slot machines to cool the air. One of the project's 40 full time sustainability professionals actually traveled to China, where the scents are manufactured, to ensure that they are indeed sustainable. One potential problem I noticed is the HVAC (heating, ventilation and air conditioning) system. A great deal of engineering went into the air filtration and ventilation controls to limit toxins and VOCs. Unfortunately, my hotel rooms in both Mandarin Oriental and Vdara were unbearably warm, even when it was in the high 50s outside. Of course I turned the A/C on, but in both cases, the actual room temperature was many degrees warmer than the thermostat setting. This was quite frustrating, and makes me wonder what happens in summer when it's 110 degrees outside? Hopefully, this is a teething problem that gets worked out soon. If it sounds like I love City Center, OK, guilty. Odds are, so will you. The architecture, design and materials, the flagship luxury stores, more great restaurants from foodie celebs like Wolfgang Puck, Michael Mina and Eva Longoria, the list goes on. The big question is, can the wounded economy support such an ambitious, upscale, high overhead venture? The whole thing could be a case of great product/bad timing if things don't pick up. At risk of cliché, time will tell. There is too much to talk about in one column when it comes to the new Emerald City, so, we will continue next time with Part 2. Oh, one more thing: if you're at all curious about seeing this architectural wonder in person, do so now. Introductory prices are in effect so rooms can be had at special rates, at least for awhile. It's a great opportunity to enjoy a "benefit" of the recession, high roller accommodations at reasonable prices. Dining, drinking and shopping, however, are priced to match the luxury surroundings, no deals to put it mildly. For those of you who have already been to City Center, feel free to comment, I'd love to hear your impressions. Thanks!